Experience Jimi Hendrix on a new level as he comes to life on the groovy reels! 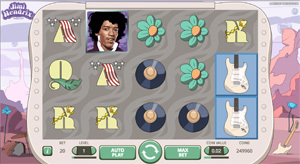 The Jimi Hendrix slot is the 2nd slot released in the NetENT Rocks Series. Players can get up close and personal with the guitar maestro while cashing in on up to 80,000 coins! It’s only fair that NetENT released a slot solely focused on Jimi Hendrix. He is one of the most influential electric guitarists in the history of music. He is also described as “the greatest instrumentalist in the history of rock music” by the Rock and Roll Hall of Fame. While Hendrix passed away in the 70’s he continues to live on in soul and sound! Jimi Hendrix is a 5 reel, 3 rows and 20 paylines video slot powered by NetENT. Jimi Hendrix opens the slot with a smashing guitar solo and a taste of what’s to come. The slot is medium variance and you can play from as little as 0.01 to a maximum of 200 per spin. The coin values range from a low 0.01 to a solid 1 per bet line. Get groovy with flower power and Woodstock flashbacks on your desktop, mobile or tablet device. Jimi Hendrix spreads love once more with a range of top quality bonus features including the Purple Haze Feature, Crosstown Traffic Free Spins and Red Guitar Re-spin to name a few. Jimi Hendrix suitably features as the wild of the slot. The wild substitutes for all other symbols except the scatter. During the main game players can activate one of two features: The Purple Haze feature and the Red Guitar Re-spin. The Purple Haze feature starts when the Purple Haze symbol lands on reel 1. During this feature card value symbols 10, J, Q, K and A will turn into wilds. 4 or more Red Guitar symbols trigger the Red Guitar Re-spin feature. If a new Red Guitar lands on the reels during the re-spin another re-spin will be granted. The re-spins only end when no new red guitar symbols appear on the reels. Three or more scatters on the reels triggers the Pick and Click feature. The scatter symbol featuring Jimi in a pink shirt and white guitar only appears on reels 3, 4 and 5. During this feature players can win one of 4 prizes: a Coin Win, Crosstown Traffic Free Spins, Purple Haze Free Spins and Little Wing Free Spins. Each Pick and Click game awards only one prize. Players have to collect 3 of the same symbol during the game to unlock their prize. 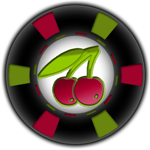 Collect three coin symbols for a coin win and your initial bet will be multiplied by a random multiplier of x8 to 30x. Collect three Crosstown Traffic Free Spins symbols for 6 free spins with active wild reels. The wild can appear anywhere on the reels, but is guaranteed to be present with each spin. Collect three Purple Haze Free Spins symbols for 6-12 free spins. During the Purple Haze feature, card symbols A, K, Q, J and 10 transform into wilds. Last but not least, collect three Little Wing Free Spins symbols for anything between 6 and 12 free spins. During this feature players will also receive between 3 and 5 overlay wilds that can appear at any random time. It might seem confusing that a slot themed around a rock guitarist comes with a rather Hippie-like design. The Hippie era was known for its unlimited supply of love and psychedelics. While Hendrix was a rocker he carried the soul of a hippie. Some people described him as a person that knows only of love, light and good tunes. NetENT did an excellent job with the design of this slot. In fact, the amount of effort they put into the entire Rock Series is unbelievable. NetENT designed each slot specifically to fit the theme or in this case musician presented. Where the Guns ‘n Roses slot plays off as a live concert, Jimi Hendrix brings out the essence of what made Jimi Hendrix the legend known and loved by all. Motorhead is the third and last slot in the series, themed around one of the most popular rock bands of all time. Each of the slots featured in the rock series come with a mass variety of bonus features, iconic moments and spectacular rewards. If you are looking for a musical slot with less going on be sure to try The Super Eighties also by NetENT. Features: Wild substitutions, Scatter Symbols, Red Guitar Re-spin, Purple Haze Feature, Pick and Click Feature, Coin Win, Crosstown Traffic Free Spins, Purple Haze Free Spins, Little Wing Free Spins. Fans will be delighted to hear that this legendary slot is available on all devices from desktop to mobile and tablet devices. The simplicity of the design might even be appreciated a little more on mobile and tablet screens. The HTML5 software make for an easy gameplay that comes without glitches. It also ensures that players get the full Jimi Hendrix experience while making the shift from desktop to mobile. 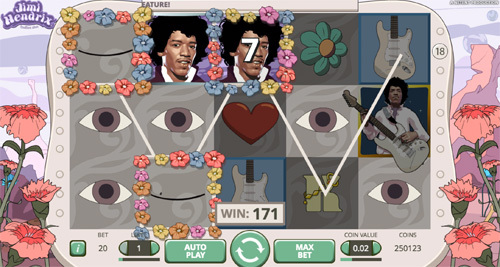 The Jimi Hendrix slot truly is a sight for sore eyes. It’s easy to see the amount of detail that went into this slot as even the low value symbols are uniquely designed. The retro/psychedelic theme and legendary tunes will keep all your senses happy. With a variety of bonus features on offer the Jimi Hendrix slot experience is one of a kind. Players who genuinely love music, the 60’s and Woodstock will adore each second spent on this slot.